Looking for an idea of a simple educative game to play in your garden, in the forest or in the park? With this one, your kids will discover how to estimate the age of a tree! Play this game on its own or as part of a treasure hunt. What you’ll need: Pick a place (garden, park, forest, …) with various trees, not far from each other. Bring 3 meters of string/twine and a red pencil per team, plus a measuring tape. Plan for teams of 2 or 3 kids. What to do: Ask kids their ideas about how to identify the oldest tree. Explain them that trees lay one growth ring per year, and that by counting them from the pith to the bark they would find out the tree’s age…but of course they cannot cut the tree to find how old it is! The winning team is the one who correctly identifies the oldest tree the most quickly. 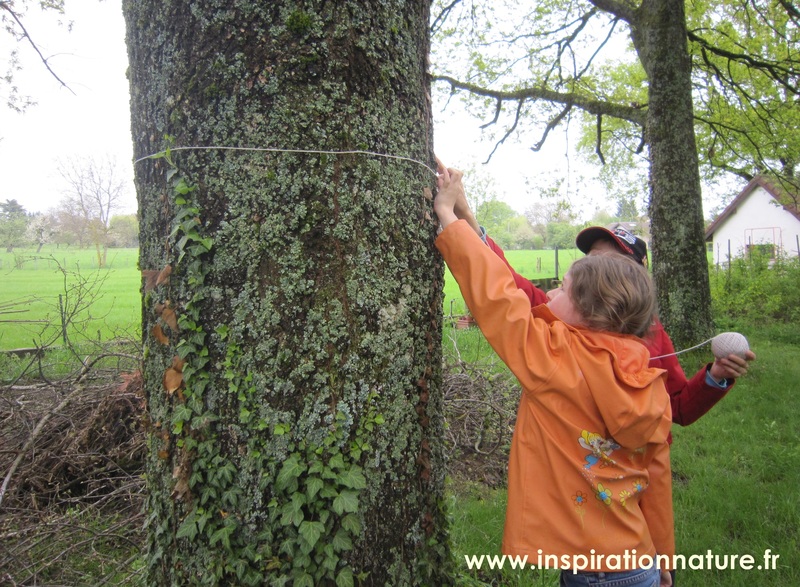 Play: Hand each team a piece of string and a pencil and explain that they will have to estimate the tree age by measuring the tree trunk circumference. 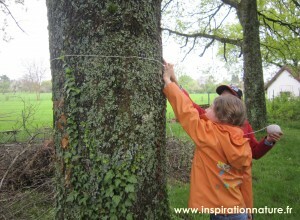 Instruct them to measure 1.35 meters from the base of the tree (you will need to help some kids depending on how high they can reach), wrap the string around the tree tightly and evenly at 1.35 metres, draw a mark on the string, and measure the string up to the mark. When comparing results for the different trees, the longest string will designate the oldest tree. You can also ask oldest kids to calculate the tree age, knowing that circunference grows approximately by 2,5 cm per year, and award points for correct answers. At the count of 3, each team darts to start measuring. Reward: once the oldest tree has been found, a clue to help find the buried treasure is handed to the winning team. Our oak trunk circumference was 1,60 m…how old do you think it is?